I got it! I got it! Finally, I know one. Those fluffy white things in the large, otherwise empty blue expanse in the top half of the photo were a dead giveaway. I literally can see some of those exact same things outside MY window right now, and I’m in Albuquerque. Therefore, this photo was taken from my room at the Midtown Days Inn in Albuquerque, New Mexico. Corpus Christi, Texas. That’s a wild punt. If I knew the proper golfing analogy, I’d use that instead. 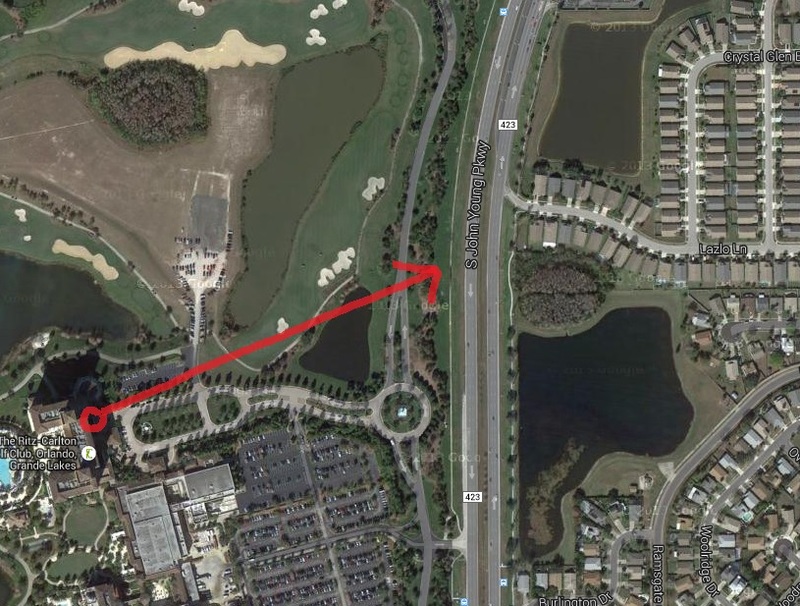 The cars don’t have license plates on the front, so this golf course is probably in Florida. I’ll count that as a moral victory. Palm trees, SUVs, cookie-cutter houses, flat terrain as far as the eye can see. This is America at its most boring. Boca Raton it is. I spent an hour looking at golf courses. Naples, Florida. That’s all I got. Meh. Looks like somewhere I’d probably have no fun and complain about the humidity. I am going to go with Idon’tcare, Florida. Or somewhere down south (palm trees) that doesn’t require front license plates (mostly down south, anyway). I think that’s the county seat of Ialreadywon County. Florida. That’s all I’ve got for you. A subdivision of one-story houses, a golf course, and lush-looking trees (including palm trees!) on land as flat as a pancake. Whereabouts in Florida? I’ll let the more diligent Dish readers answer that one. Kissimmee, Florida? It looks like the view from one of the many hotels in the area that host business conventions and cater to Disney-hungry tourists. So excited that you used my picture this week. Will a photo from a major tourist city in the continental US be too easy? After living in central Florida for several years, my first thought was Orlando: completely flat land, golf, palm trees, and the one towering building in the distance that looks like the Champions Gate Resort. After spending time on Google Maps, though, I couldn’t narrow it down – there are just too many golf courses in that area of the country. As for the floor and the room number – you have got to be kidding me. I leave that to people with time on their hands to call the hotel and ask themselves. Or we can just ask the view’s submitter! Did I mention how much time I saved this weekend by not competing in the VFYW Contest? 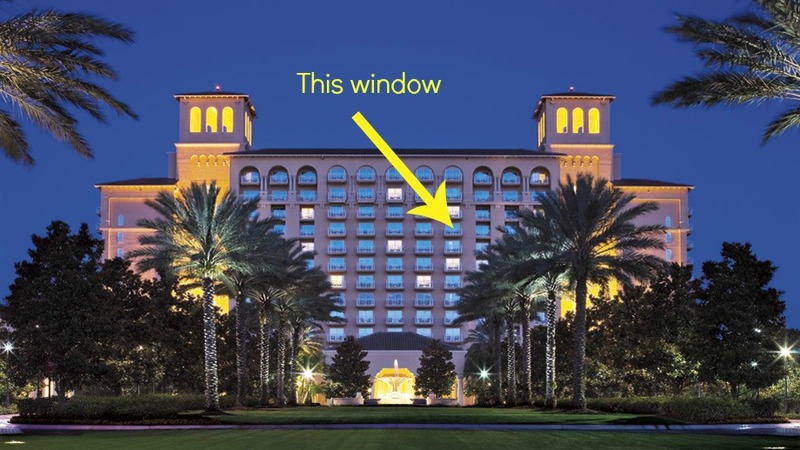 That was until you asked me to try to find a picture and identify the window of a hotel room in which I stayed almost a year ago from the outside of the building. In the pictures, the Ritz-Carlton in the hefty building with the two wings and two cupolas. The JW Marriott is the narrower long building with the single cupola. 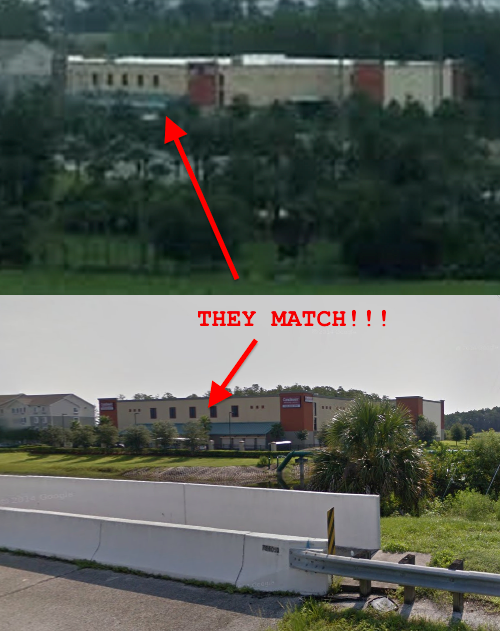 There is a low double (Ritz and JW Marriott) conference center in between the two hotels. My room was on the not yet floor in the Ritz-Carlton in the rear in the wing that was nearer to the JW Marriott. 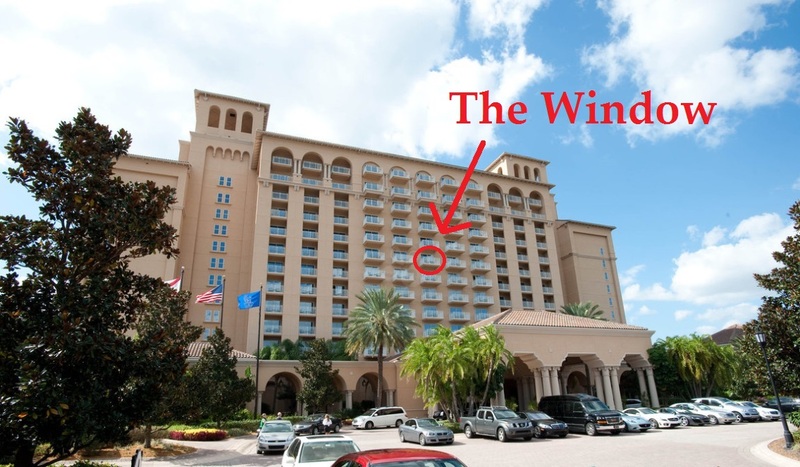 It faced outward toward the golf course – not inward toward the other Ritz-Carlton wing nor outward toward the conference center/Marriott. If you need a picture with a drawing, I suggest you contact the hotel directly. Nothing personal – I plan to enjoy my free time this weekend. 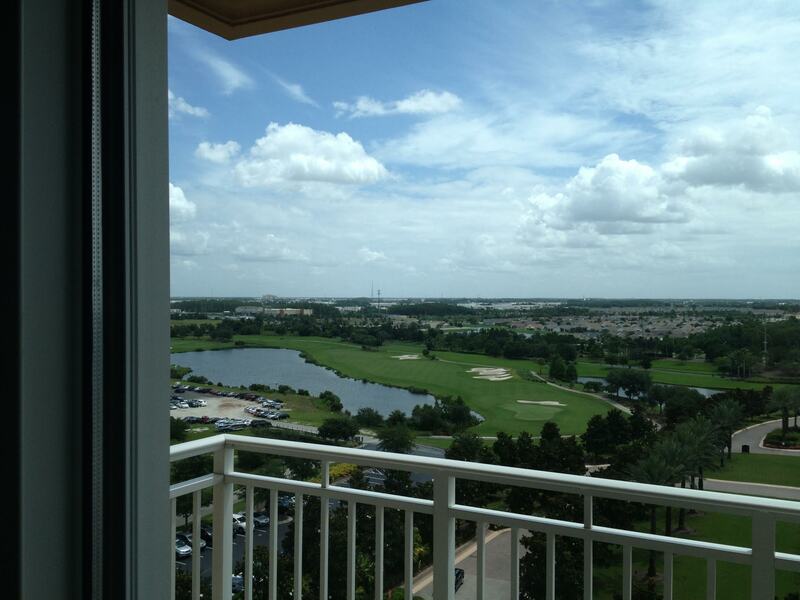 Flat, full of golf courses, palm trees, lakes, and tracts of dreary, identical, single-story housing. Can’t be anywhere but Florida. 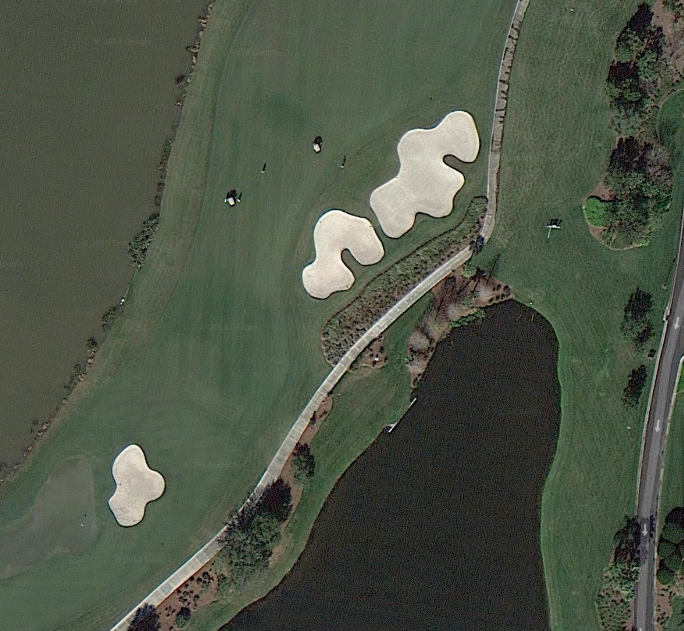 The state only has 1,481 golf courses so it was just a matter of looking at them all in Google Earth. I started working from south to north but luckily my wife looked at the picture and suggested the Orlando area. 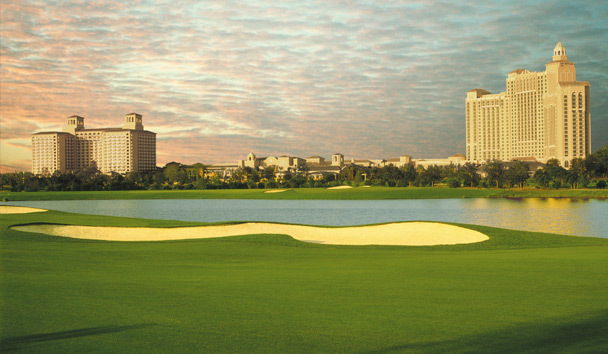 Only took me about 10 tries before I found the water hazard with the two distinctively shaped sand traps beside the fairway, on the course at the Ritz-Carlton Orlando Grande Lakes Resort. The landscape of the contest photograph made us both think immediately of Florida, although neither of us has been there. My wife picked out several buildings in the distance that appeared to be hotels – including one really large one. 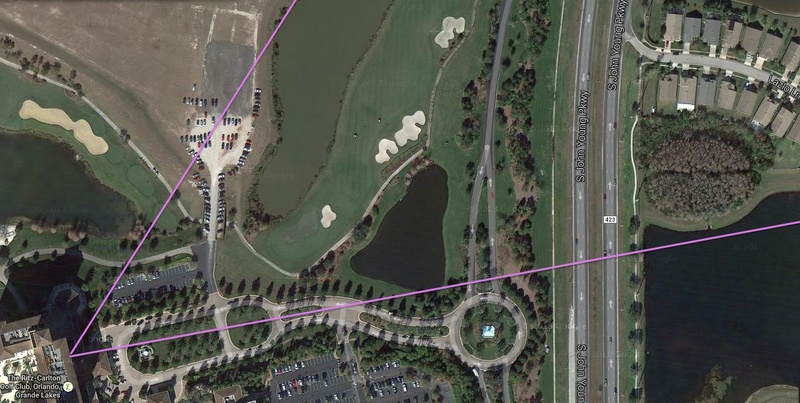 The concentration of hotels outside of an obvious urban area suggested Orlando, because it brings in tourists for Disney World and various other attractions. 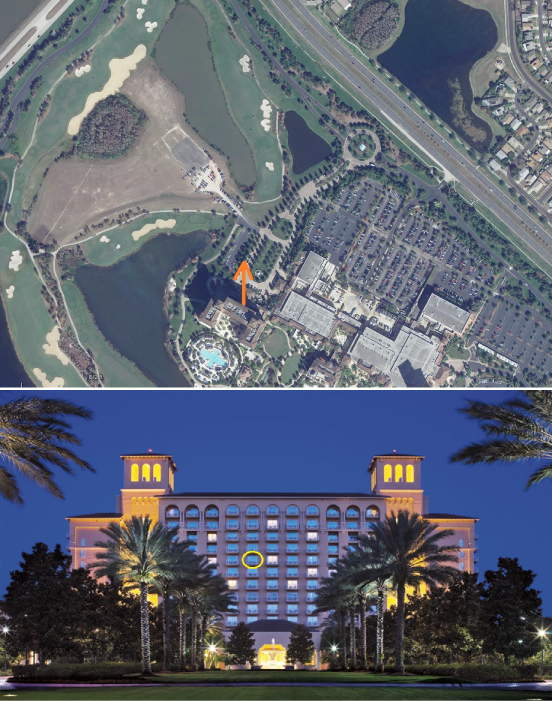 My wife tentatively identified the large hotel in the far distance to the left of the contest photograph as the “Florida Hotel & Conference Center” in Orlando, and so we studied large hotels with golf courses in that area. It was my wife that found the Ritz-Carlton. What first caught her eye was that in the paved parking lot in the contest photograph the parking spots are numbered, and all the cars are parked “backed-in.” (Likely meaning a valet-parking area). She saw an identical parking lot at the Ritz-Carlton, and from there we were able to confirm that everything else matched too. I figure every one of these I guess correctly gets me closer to the prize. After a dozen or so contest entries, mostly correct, I got a mention in last week’s contest for my Cook pine strategy and it made my day! I still look forward to this every week, though it can be infuriating at times (there are way too many hotels on golf courses). Picking the room was the toughest part. 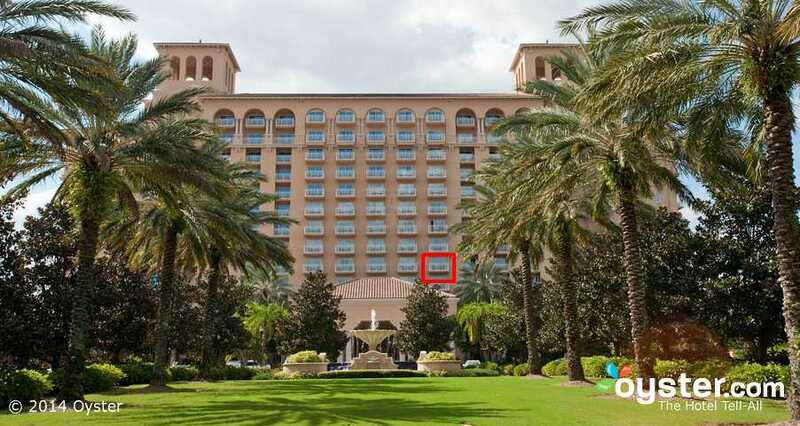 I’m guessing it’s above the hotel’s driveway, and between the lines of palm trees (since it’s facing to the left, and only one of the lines is visible in the photo). 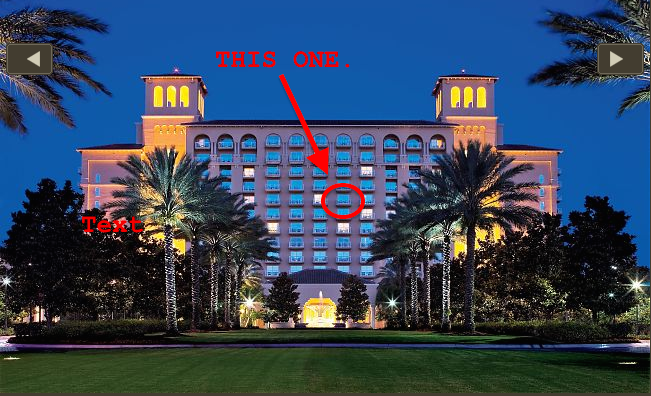 From rough guesses about positioning, I’m going with the eighth floor, just to the right of the center of the hotel. To guess a room number, maybe 811? See everyone for the next view on Saturday. No more golf courses, promise.